I was caught in a dilemma for the title of this post. You see, afternoon tea typically refers to a light mid afternoon break from 3pm to 5pm and there’s usually sandwiches and scones, while high tea is an early evening meal between 5pm to 6pm. 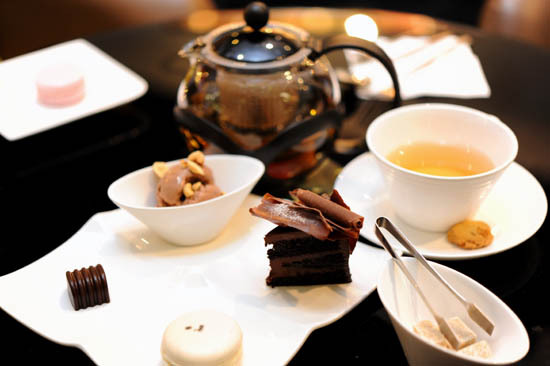 Technically speaking, Jewel Artisan Chocolate’s tea set cannot be classified under both afternoon tea or high tea since it is an all day affair from 11am to 6pm in the evening. Oh what the heck, I’m calling it Afternoon high tea, you can figure it out yourself. The $14.80++ High Tea Set at Jewel Artisan Chocolate Orchard Central includes: 1 x truffle/praline, 1 pc macaron, 1 slice of 85% Dark Chocolate Gateau, 1 dollop x Ice Cream/Sorbet, and 1 pot x Gourmet Tea. The two of us decided to share an afternoon tea set plus an additional Dark Chocolate Lava Cake from their cake menu ($10.80/serving). If you do not fancy the ubiquitous chocolate lava cake, there’s also the chocolate tart, chocolate crumble, chocolate gateau or chocolate mousse to choose from. The mini slice of 85% Dark Chocolate Gateau which comes with the afternoon tea set was rich, smooth, and very cakey (if there’s even such a word). For the macarons, there are choices of Black Palm Island Salt, Raspberry, Butterfly Pea Bloom, Green tea, Passionfruit, Dark chocolate, Hazelnut and Butterscotch. We had a macaron from the tea set, and it was so addictive. In the name of research, we ended up ordering another two macaron ($2 each). I wasn’t too impressed with the Butterfly Pea Bloom. Other than the seemingly-artificial colouring, the combination of kaya and pandan almond cream didn’t really go well together for my taste bud. The Raspberry wasn’t too bad, but it was the Black Palm Island Salt (atas name for Salted egg yolk) macaron that was truly phenomenal! It’s impossible to describe the intriguing flavor, please go to Jewel Artisan and try it out for yourself. It’s possibly one of the best macarons in Singapore. It’s a shame that there wasn’t any vanilla ice cream on the menu to go along with the Dark Chocolate Lava Cake ($10.8), so we had two scoops of hazelnut and dark chocolate (one for the tea set and the other comes with the lava cake). The chocolate lava exploded as I cut off a corner of the cake. Warm and luscious dark chocolate with a scoop of cold ice cream – life can’t get any better than this. Jewel Artisan Chocolate High Tea is a good option (11am to 6pm daily) if you are not able to make it during lunch time for the $12++ dessert buffet from One Ninety Restaurant at Four Seasons Hotel. Now, if only the chairs are more comfortable, I will be back all the time for a pot of tea, a nibble of truffle and a slice of cake. // Read my list of dessert places in Singapore. Oooh, thanks, this is going into my high tea list! Excellent value. I am sure they could have included 2 chocolate pralines though:) I will be heading there on my next visit to Singapore. Thanks for the tip. Looks promising. I will consider this for next week … when I have to bring my daughter & BFF out for afternoon tea. they look tiny though are they really worth it tastewise? i can never get enough with tiny portions, sigh. This looks wonderful. And terribly affordable it feels almost criminal to get away with all that at that price. The lava cake seems pretty impressive, is it served with a tablespoon of CUSTARD?! nope, diva, it’s vanilla sauce. The difference between ‘afternoon tea’ and ‘high tea’ comes from their origins. Both of them describe a meal-break between lunch and dinner time. However, ‘afternoon tea’ was typically used by the upper-class population who laid back in their lounge, while ‘high tea’ was used by the poorer population who dined in the kitchen, hence sitting on a ‘high-rise’ chairs to prevent contact with any living creatures on the ground. I read this in a life-style magazine years back.